Escape: The Curse of the Temple - after hearing the title of the game, you pretty much know exactly what it is about. Players take on the role of Indiana Jones-like adventurers deep in an exotic temple. The object is to work together to get all players to an exit before time expires. This task is quite difficult, involving exploration, teamwork, and time management. Escape is exciting, a bit chaotic, loud, and also very, very fun. I am a huge fan of cooperative board games like Defenders of the Realm and Flash Point: Fire Rescue. It is far more relaxing to sit down with my friends and family to play when there are no competitive gameplay elements and we all contribute to meeting the goal. However, one fundamental flaw in games like these is how easy it is for one player to dominate the game to the point where it isn’t fun for anyone else. Often, the player with the most experience with the game will give too much advice for newer players. A bossy player like this really detracts from the feeling of teamwork and camaraderie. Escape fixes this problem with the co-op genre in interesting ways. The game has a strict time limit of ten minutes. While you can just use a standard timer, the game includes a CD with a ten minute soundtrack. It is glorious; tense music with rising crescendos add a heart-pounding ambiance to the whole experience. Players also take turns simultaneously, and thus make their own decisions largely without input from others. Because of the timer and simultaneous action, it is all but impossible for one player to dominate the game. 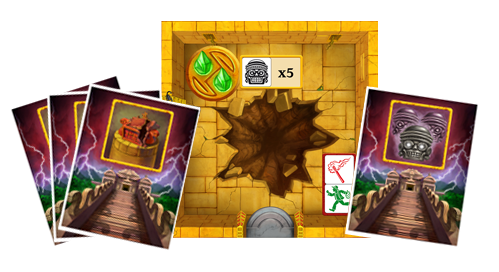 As the game begins, players place their adventurer meeple on the starting tile, and two other tiles drawn from the stack are placed next to it. From here, players can explore, attempting to activate enough magic gems found throughout the temple in order to lift the curse and allow them to escape. The more gems that are activated, the easier the final exit becomes. So how exactly do the adventurers find their way outside the temple? Each player gets a set of five dice to roll, and each face has a different effect. The green adventurer symbol allows movement from one tile to the next. Blue keys and red torches are used to enter tiles marked with these symbols, and also can be used to activate gems. Beware the black skull! When this is rolled, it locks the die from being rolled again. However, don’t despair: rolling the golden mask will unlock up to two skulls, allowing you to roll them again. Rolling dice over and over again is a hoot, and adds to the frenzied feel of the game.